Mahi Mahi is an extremely colorful and flashy saltwater fish with a distinct look. In general their coloring is a bright green blue on the upper part of the body and a bright yellow on the sides. It's common to find blue and golden blotches of color on their sides. They have the ability to manifest a wide range of brightly flashing colors as they swim. The general body shape is sharply tapering from the head to the tail. Females have rounded heads and males have foreheads that protrude above their body. They have very long dorsal fins. 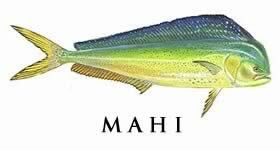 Mahi are also known as Mahi Mahi, mahi-mahi, common dolphinfish and dorado. They are found throughout open oceans. While young, they live floating in sargassum weed. They can be found in the Caribbean, the Gulf of Mexico, Hawaii, the Atlantic Ocean near Florida, on the west coast of North and South America and in Southeast Asia. Mahi are extremely fast swimmers, making them a challenging sport fish. They are very fast growers and tend to live not much longer than 5 years. They breed year round in warm water. Considered to be one of the best, having long strong runs and fabulous jumps, not to mention its determination. There are a variety of baits and fishing tactics that can work to catch Mahi. Artificial lures, feathers and spoons work. Adult Mahi will go after squid, fling fish and other small fish while working weed lines in the offshore. Trolling with bait rigged on #7 or #8 steel with works with 7/0 or 8/0 hooks. Chumming cut bait can be effective when they are schooling. This species is considered one of the best, with its white mild meat suitable for a variety of cooking methods.